A couple of Instagrammers posted photos of the bright pink and orange Elfbead called Sweet Flowerworld LE and I was instantly smitten. Yes, I also buy beads based on other people’s photos! 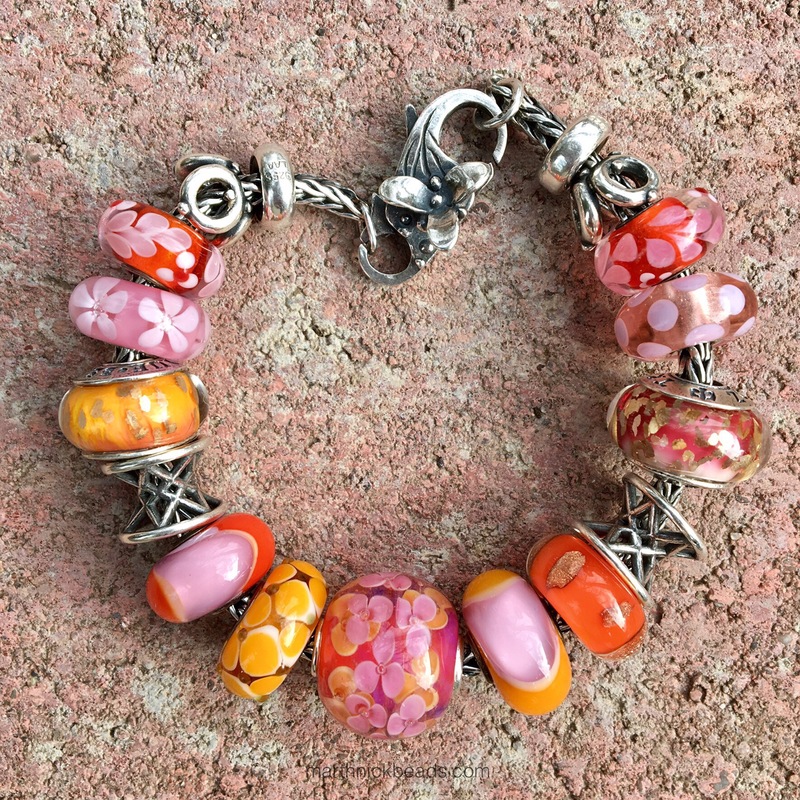 I love pink and orange together plus when you add in the little flowers, I absolutely couldn’t resist it. 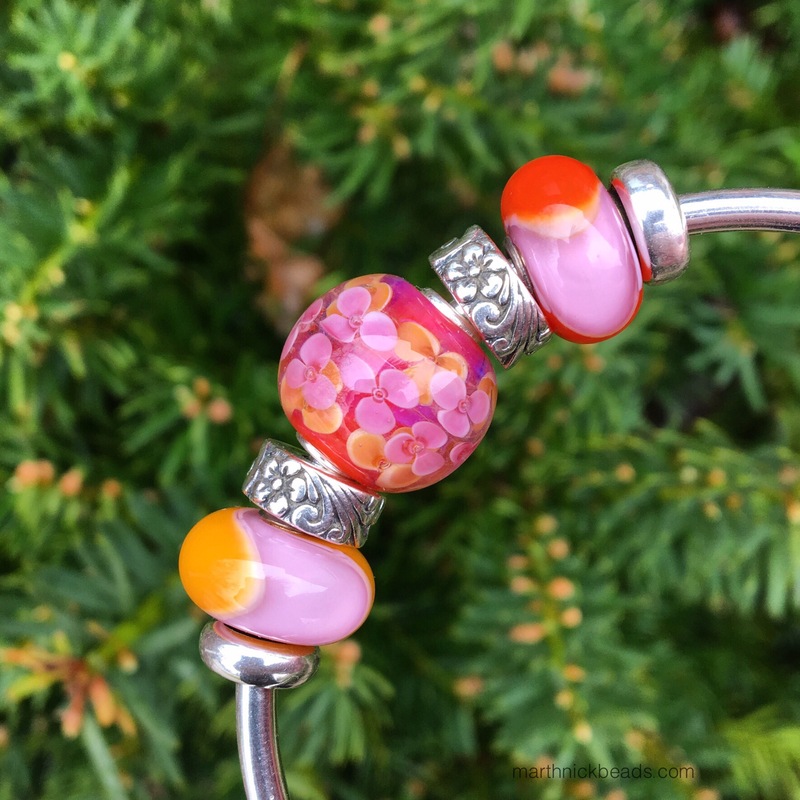 Due to it being shaped like a focal bead, I first tried it on a bangle with the Redbalifrog Hawaiian Floral Spacers and two Trollbeads called Red and Lavender Armadillo Bead (right) and the Pink and Orange Armadillo. To make a combo I added in a bangle with the Water Lily Spacer and the Twisted Bangle. The colours in the Sweet Flowerworld also match a couple of True Beadz-the Friendly Smiles on the left and a Treasure on the right. 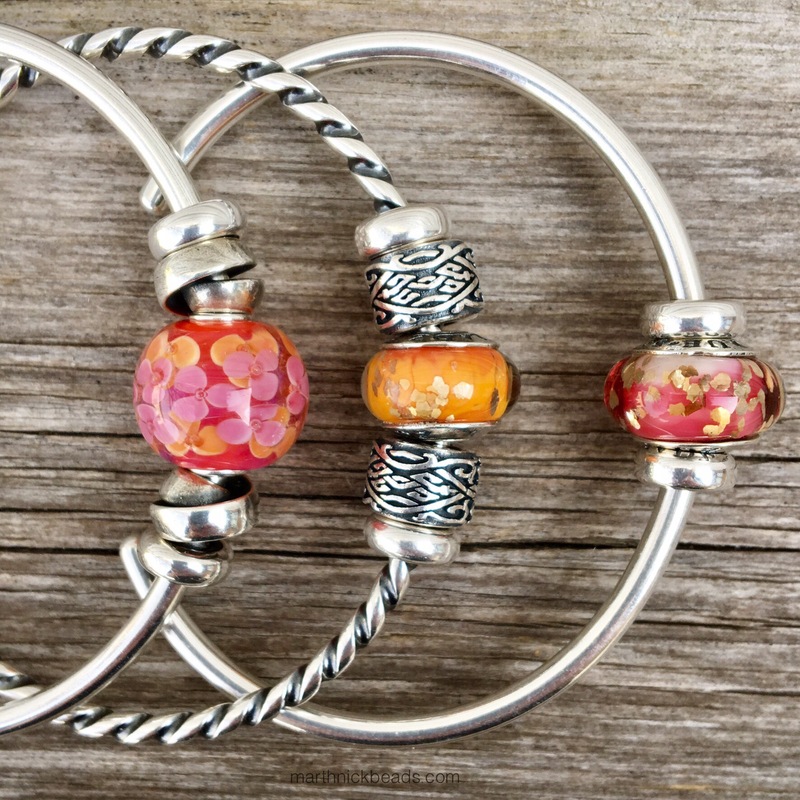 The silver beads on the bangle on the left are two Trollbeads Neverending ones. Ooo…I just bought the Neverending Ring and it is fantastic! I’ll do a blog post on rings sometime soon. The middle bangle uses two True Beadz Wheels of Time. For a large bracelet I added some Trollbeads uniques and my new Summersday bead from Germany. It’s the pretty pink daisy one on the left. I need to thank my friend Sarah for not buying it! These beads are hard to purchase as they get snapped up really quickly. She had it in her online shopping basket but then changed her mind and then I picked it up! 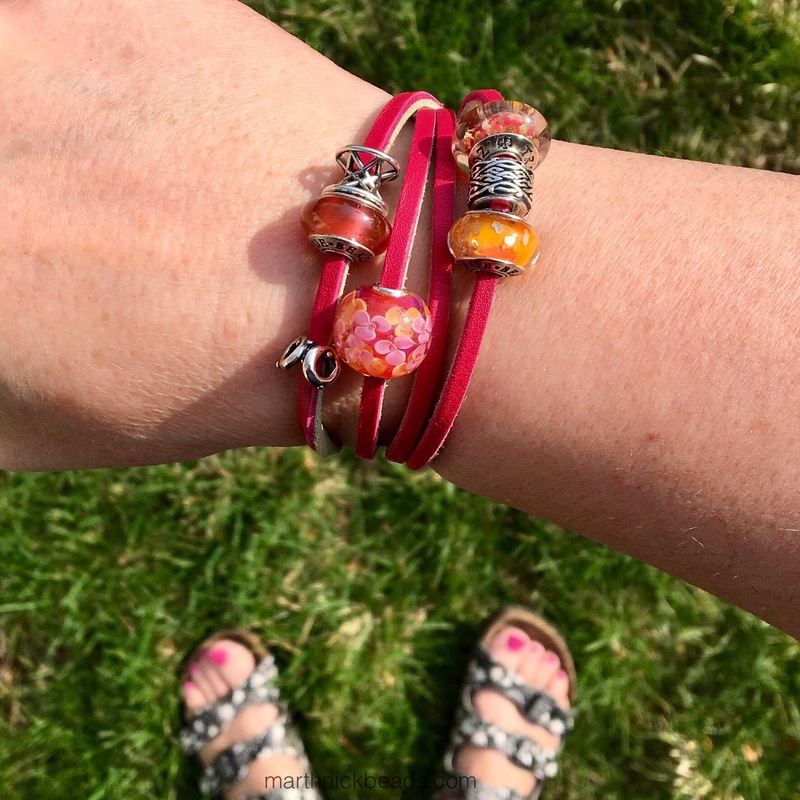 On Monday it was sunny and warm out so I did a #mcctrish using the Cherry/Sage Green Trollbeads Leather Bracelet. The other True Beadz on the left is the Almost Quartz. I should have put the Ohm Beads Jar on here, as this looks like a thirst quenching kind of bracelet (not that I plan on drinking beads!). That’s it for today! Say, did anyone get their Perlen sale beadmail in yet? I saw a few people with new things on Instagram. 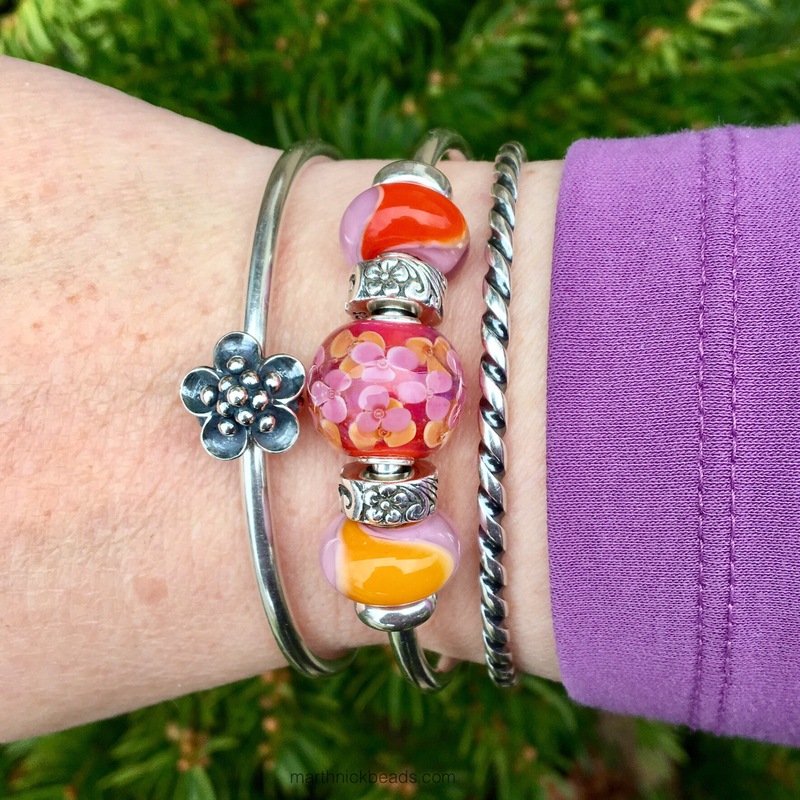 Next week I’ll do posts on the Spiritbeads Silver Sakura and the Trollbeads silver Daffodil of March bead, as my daffodils are just about to bloom! Have a Happy Easter weekend everyone! 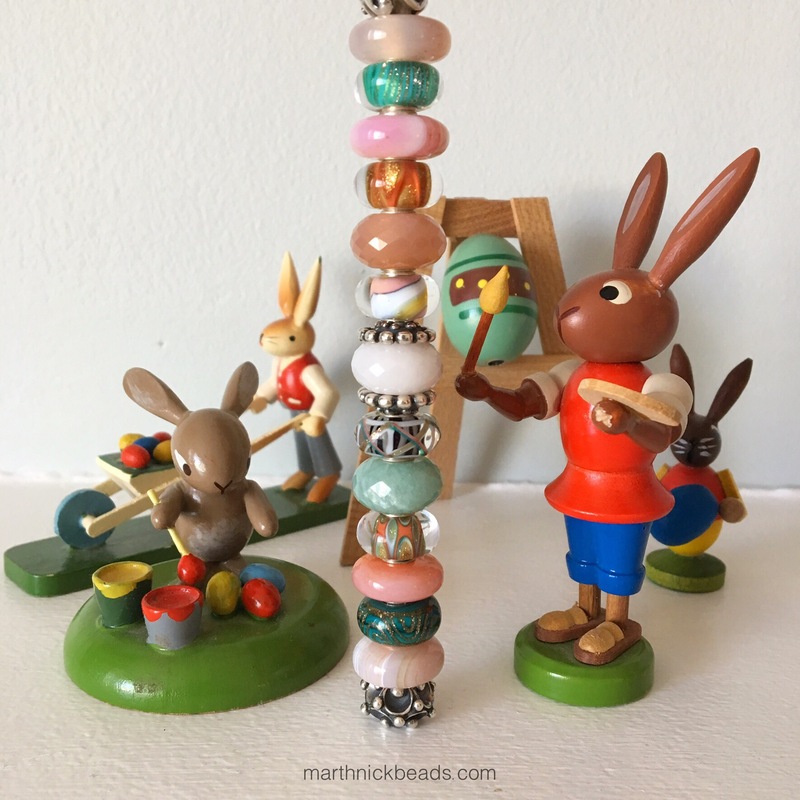 I’ll leave you with an updated ‘bunny painting Trollbeads’ photo! This is a glorious post! I love all of the combinations, all my favourites, Trollbeads, Elfbeads, Summersday beads and those amazing new Truebeadz. I feel like I’m drunk and it’s only 8am! I will comeback to this post after work tonight and seriously rethink my own tiny collection. Thank-you for making me look at each bead as if it is the first time I’ve ever seen them. Have a beautiful day Martha. Sarah, I’m so glad you enjoyed this post. These really are your kinds of colours though and I also love the bright colours. I am wearing the pink leather combo today, even though it is chilly out and am imagining that it is a hot summer day! These beads make me think of orange juice and fruity herbal iced teas! Enjoy your day! 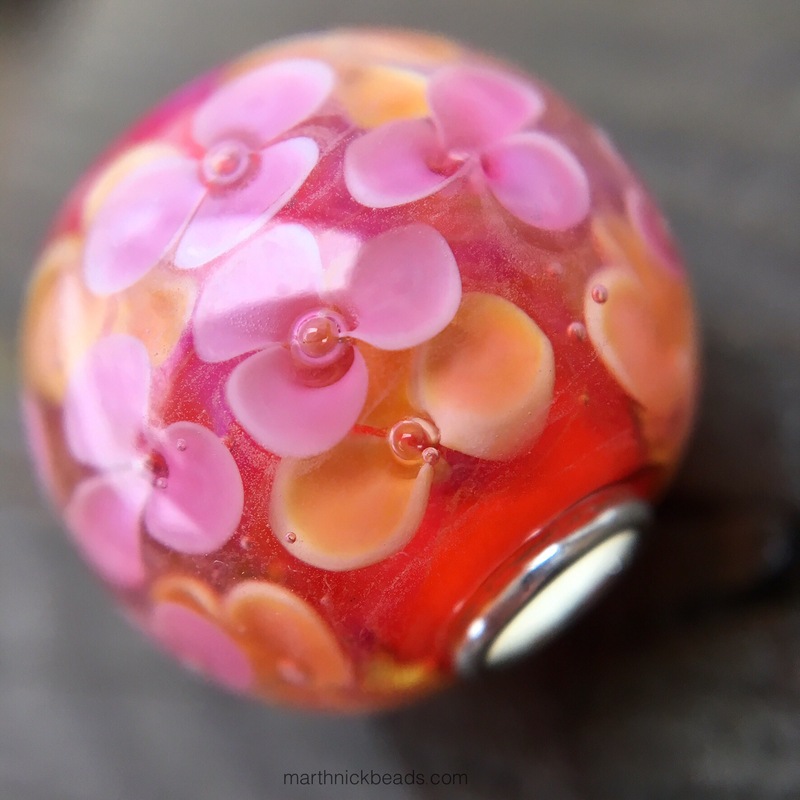 What a pretty Springy flowery bead! I love the shape. I can see why you couldn’t resist this one. It’s gorgeous with the Dillos and everything else you paired it with. I always enjoy your Painter Bunny and like to see what he’s up to! I agree Dawn, this is the perfect bead for spring and at only $39 CAN (which is about $30 USD), quite a good deal! I don’t know if you can tell from the photo but when I unwrapped painter bunny this year, both his arm and the paintbrush had fallen off and I had to re-glue them back on. These decorations are probably 35 years old, I figure. I don’t have any Elfbeads, but I think I’m going to be getting one. I love this bead and I’ve been looking at it repeatedly. Which is a good indication I’ll be buying it. Ha ha! I know what you mean, Suzanne. Since you’re in America, you would probably find it a good deal to get it where I got it, which is Beadbillboard.com. She has live images so you can choose exactly which one and with the exchange rate it would work in your favour. Hi Martha, Thanks for the info! Beadbillboard is a shop I wasn’t familiar with. I checked the site and I’m really impressed. Also, I think the fact that the owner works with veterans is very commendable. Yes, she lives in my city, in fact. The veterans hospital is very close to me, like I could walk there, even. I think there’s a special next week where it’s Buy 4 Get 3 free. I say that because my beads n’ coffee friends are going to her place to buy some next week! The deal will be offered from the 14th of April to the 21st of April (or longer if stock allows). I’ve been getting your posts since our $10 sale and I just love them. You do such a wonderful job with your blog and your photos are beautiful! Do you mind telling me what you use to make them? Hi Carrie! The photos? I use an iPhone 6S to do the whole thing-take the photos, edit them and write the blog. I have an olloclip attachment for the macro photos that just clips on to the iPhone. It’s amazing what the iPhones do now! I will have to get one of those attachments. Your sense of color and design make your blog one of the best I’ve ever seen. Thanks for doing it and thanks for the info. Thanks for your kind words, Carrie! Hi again Martha, I got to thinking if this bead could work with Trollbeads Roses For Mom without being too busy. I found photos on Instagram from someone who did that and I think it looks really pretty. Yes, for sure! I just forgot to use it, to tell you the truth! The colours look great together! Maybe you saw one of my pics on Instagram? She / you takes always such gorgeous photos of the beads! Love your combos, as usual, Martha! The Flowerworld is so pretty, and the vibrancy of the colors really pops. I’ve been tempted by a few of the Flowerworlds in different colors, but have been trying to be good in advance of the Great Lakes event coming up at the end of the month. Are you coming down for it, by the way? Love your painter bunny too. A very Happy Easter to you and your family! Hi Kim! No, we aren’t coming down this time. I have seen so many gorgeous colours of those Flowerworlds also. Those would be fabulous to pick out in person! I can’t wait to see what you buy there! Happy Easter to you also, Kim! Love your bracelets Martha! ❤ Flowerworlds are gorgeous beads, I had to get 1 of all the ones that came out in the Wish Collection (I have 2 of the Nebula since they were the free bead that time and I ended up doing 2 sets!). I like the fractal versions too, really pretty. The price is really good on these for the size, detail, and quality they are. Jennifer at Bead Billboard is great, my first purchase from her was when her store launched and I keep coming back, she is very sweet, and easy to email or message on Facebook. The CAD/USD exchange rate doesn't hurt either 😉 it's basically equivalent to buying from Europe and deducting VAT. I just ordered for the new Monroes deal, getting 2 blue Monroe Flowerworlds with stripes going down the middle, along with some other goodies (2 Lovely Valentine since I got the Nebulas for last deal, and a Carnival Flames Fractal to go with my single from a free set before)! Hi Natalie! Yes, the exchange really make the beads quite inexpensive for you guys. Maybe I’ll go with my friends when they go to buy the deal, although I don’t need any more beads! 😉 Your new purchases sound lovely. I will look them up to see what they are! You should definitely go look if you have the opportunity, although I can see how it would be a temptation! Elfbeads are pretty addictive 😉 I’ve never gotten to see them for sale in person, just bought online, all I can ever see in person is Pandora. I have also seen the Sweet Flowerworld on people’s Instagram bracelets. I just love it, it is so bright and cheery. I don’t have any Elfbeads (yet), but I think I will check out Beadbillboard!